People encounter a lot of options daily, whether it’s where to shop, what to buy, etc. There are a lot choices, which means there is a lot of competition. As a business, you want to get your subscribers to act now rather than later. If you wait too long, then you may miss your chance to make a sale or accomplish your goal. This is why it is essential to convey a sense of urgency in your emails. Adding content that helps nudge your subscribers to act right away is a strikingly effective way to increase email openings and potential sales. If you need inspiration, then look no further than your own personal email inbox. Like most shoppers, you are probably subscribed to your favorite stores and brands. In your inbox, you may find that many of the subject lines can make you feel that time is running out. You may even end up feeling that you will miss out on something amazing. Have you heard of FOMO (fear of missing out)? A lot of offline and online shoppers have been struck with FOMO at one point or another. An effective strategy at creating a sense of urgency is to place emphasis on the likelihood that they might not get the same opportunity to purchase your coveted products. As a business, you may consider letting your subscribers know that certain supplies are limited. Don’t be afraid to use capitalization, exclamation points, and emojis in the subject line. Just don’t go overboard. You can capitalize short phrases. Unless your subject line is really short (max. 5 words), refrain from capitalizing your entire subject line. Subject lines that are in all capital letters may be marked as spam. Also, feel free to use exclamation points to help depict a sense of urgency. Set the maximum of only having one exclamation point per phrase or sentence. Avoid using “!!!! !” all together. Rather than giving a sense of urgency, too many exclamation points can give the feeling that you are shouting at whoever is reading the subject line. When it comes to expressing emotions, emojis can be quite effective. 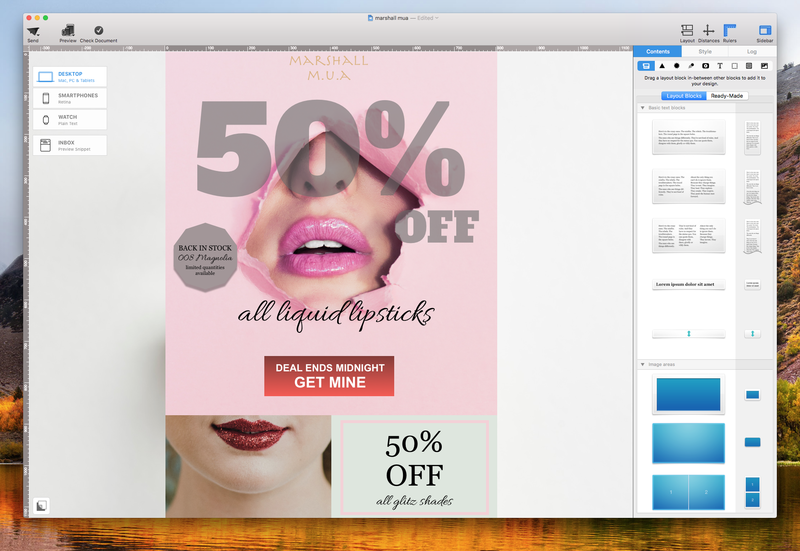 Visuals in the subject line may help your email pop out from the rest. One of the easiest way to add a sense of urgency is to add a deadline. Highlight that their time is running out. Make sure the deadline is included in the content and even in the subject line. Also, try to add both the date and times of the deadline. The specific details will make it more clear to the recipients just how much time they have. Why do we like it? Nordstrom Rack shows a clear ending date right at the beginning of the newsletter. The ending date is hard to miss. The company also places a prominent CTA button a little below the headline, making it easy for subscribers to act. Why do we like it? Nordstrom Rack includes the ending time of the deal right at the top of the newsletter. It is also worth noting that the company includes the time zone in this email design, which helps prevent confusion. When it comes to limited-time deals, it is really important to be as specific as possible. Extra tip: The best practice is to include the date, time, AND timezone. Furthermore, make it a habit of including the deadline within the newsletter body. Do not limit yourself to only adding deadline details at the footer. 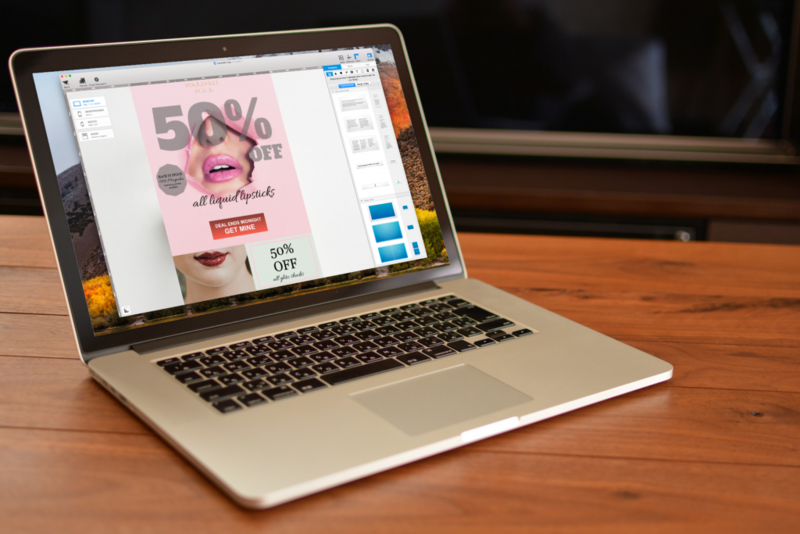 If you are having a sale, then it is important to highlight the savings that your subscribers can potentially save. Deals help create a sense of urgency because people do not want to miss out. Therefore, you will want to add the savings or deal in bold, big letters. This way, your readers can easily see their savings potential, even if they are just skimming the email. Also, try to add the percent discount or the gift voucher at the top rather than the bottom of the email newsletter. Why do we like it? 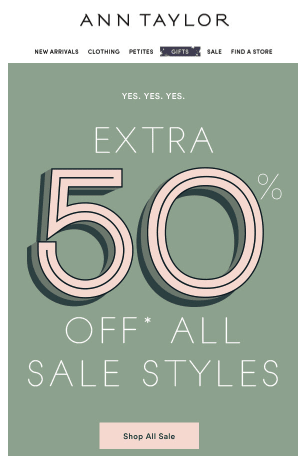 Ann Taylor makes a bold statement by placing a huge 50% off text in the center of the email design. Also, the newsletter keeps the content short so that the focus only goes to getting an extra 50% off. A contrasting CTA is placed under the discount statement. We also give them a big two thumbs up for matching the color of the discount with the CTA button. 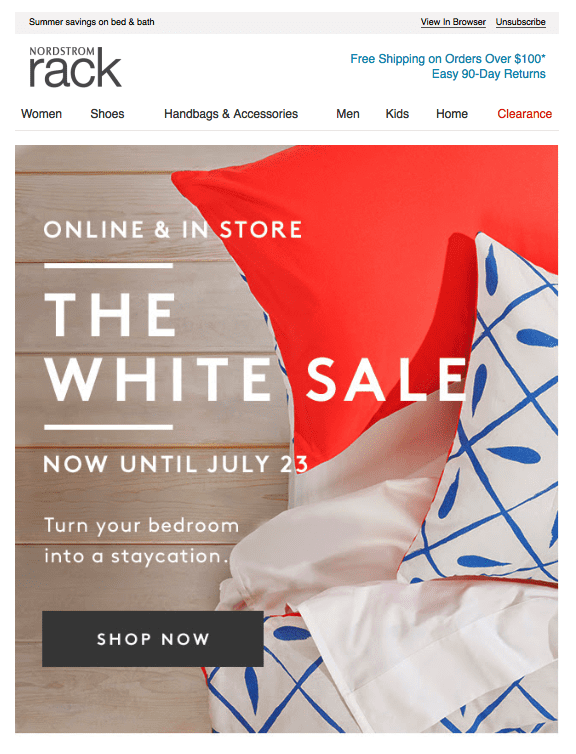 In doing so, Ann Taylor is visually connecting the discount with the action that subscribers are supposed to take. As email designers, you want to strategize how you design your emails based on the important messages or points you need to get across. In your color scheme, try to pick the brightest color as the background of your main message. You can also try using a colorful GIF background. Remember, you goal is to get your readers’ eyes to the main point of your email. Why do we like it? Shopbop adds a colorful animated background to its main message. It is impossible to miss. 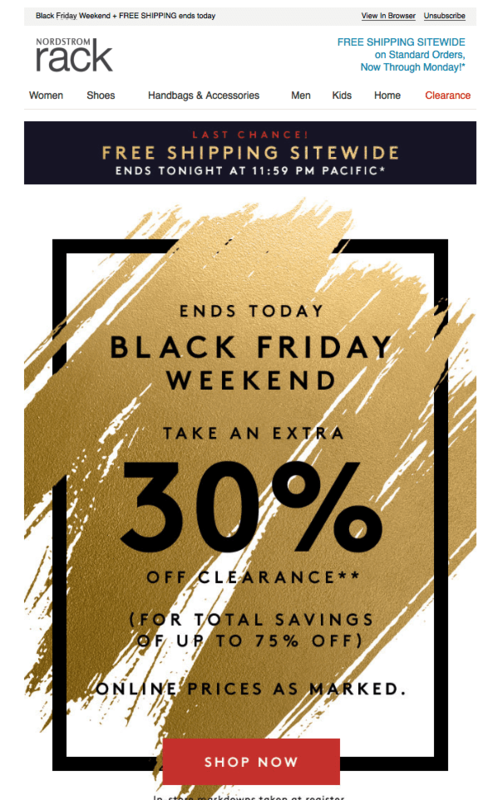 Since the background is very eye-catching, Shopbop balances the newsletter out by having a short email copy and adding simple black and white CTA buttons at the bottom. Believe it or not, combining an active and urgent word/phrase together is not that common for CTA buttons. You’ve probably seen buttons that say “Get Mine Now” or “Book Today.” They just include action-oriented statements. Now, we challenge you to go beyond the ordinary CTA buttons. Try combining urgent phrases with verbs. In doing so, you are giving your subscribers a reason to act fast. If you have a short email copy and only a few text, then you can venture out with longer CTA buttons or links. However, if you do have a relatively long email copy with a lot of text, then aim for a short CTA button. Why do we like it? In this newsletter, Ann Taylor keeps the email copy very short with very few words. This is a good balance with the flashing red-colored background. At the bottom, Ann Taylor chooses to use a CTA link that combines urgency with an action-oriented phrase: “Very Last Chance To Shop.” Ann Taylor’s CTA link makes it very clear why the reader should act (it’s his/her last chance) and what action he or she should be doing (shopping). Whether you are creating a sense of urgency because it is time-sensitive or scarce, make sure to repeat your key messages in the email body. You do not need to repeat the same phrases word-for-word. However, adding key phrases throughout the email will help stress urgency. Feel free to repeat your subscribers’ potential savings (___% OFF, Free Shipping, etc.) or when your event ends. Repetition is an effective strategy. In fact, it has been known to be a literary device that authors and politicians use. The idea behind repetition is that if you repeat the same words or phrases again and again, then it will help make the idea clearer and easier to remember. Why do we like it? 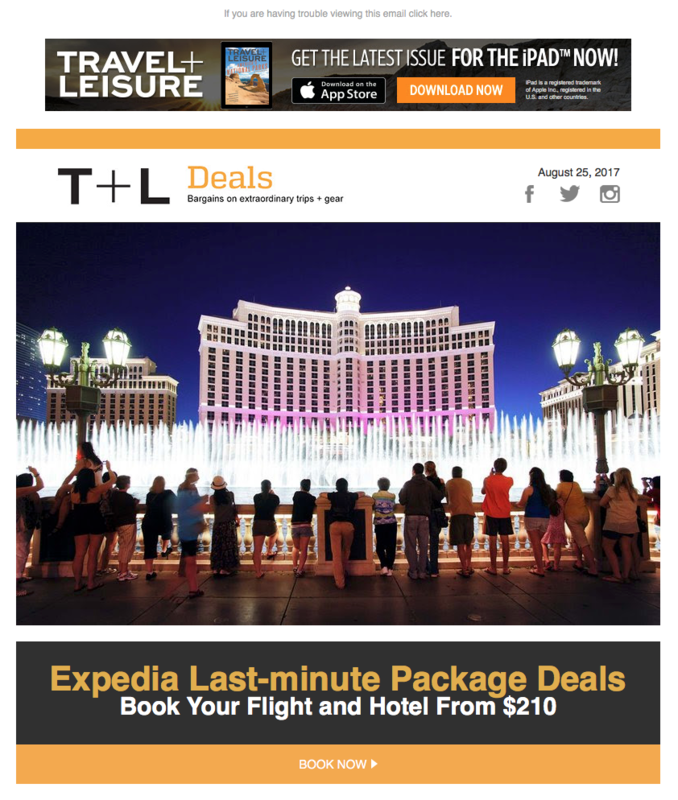 In this first third of the newsletter, Express repeats its highest percentage discount for its event, which is 50% discount. 50% off is the first thing readers will see and then followed by another layout block that showcases 50% off all dresses. For the rest of the email body, Express repeats “40% off” discounts on varying items. Repetition helps show a pattern and cohesion in the overall message. Sometimes, there’s nothing like a problem being solved to get your reader’s attention. Position your product or service as a solution to a problem. This will urge your subscribers to act fast. If you can be their hero, be their hero. Why do we like it? Travel and Leisure shares last minute travel deals for Labor Day. Along with that, Travel and Leisure also shares fashion, shoes, and wallets that are appropriate for travel. If you have a hot product that typically sells out quickly, use this to your advantage when marketing your restocks. When people know that an item is in hot demand and sells out quickly, people tend to act more quickly. “Your favorite items you missed out on are now back in stock. Do not delay. Only # remaining. Why do we like it? 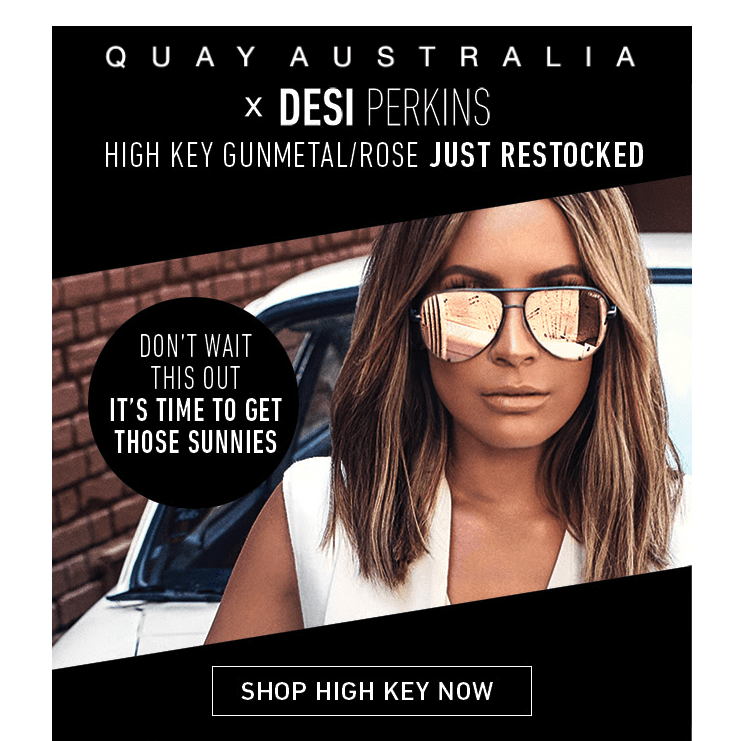 Quay Australia created a straightforward yet an eye-catching newsletter that brings focus on a pair of sunglasses that has just been restocked. This line is a special collaboration with an influencer, and the company wittily sets a photo of the the influencer wearing the line as the main picture of the newsletter with an eye-catcher that specifically states that the reader should not wait to grab his/her pair.